As much as I love a good pair of pumps, they're not always the most practical choice. I bought these pink suede shoes last year and even though I don't wear them as often as I would like they still remain a favorite pair of mine; as there the perfect finishing touch to a rather neutral outfit. Submission of IFB Project #93. Love the denim on denim and how u added the pop of pink to the outfit!! Loving the pops of pink! I totally agree with you on the whole heels situation. I can never find a pair that is comfortable enough to wear for more than a few minutes!! Such cute cut off shorts, with the pink suede shoes. Adding a white blazer is so pretty as well! 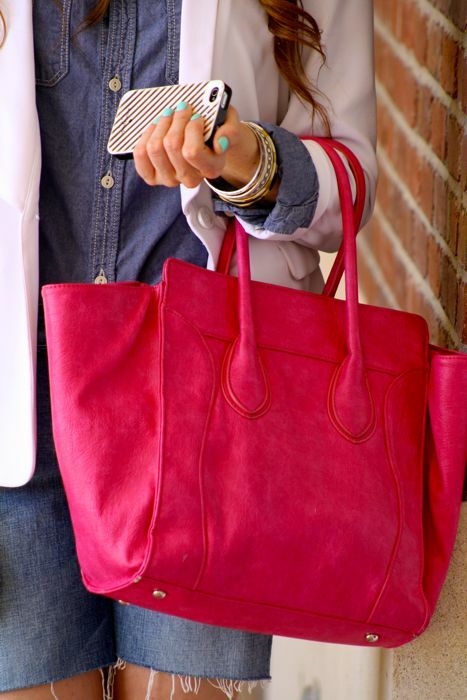 Loving the pop of color with accessories! Love the polished blazer with the casual shorts! You look so pretty! Found your blog via GLAM tweet!! Love your style!! Stay in touch! The shoes are amazing with your bag and lipstick. Love the bright pops of color Ashley! Absolutely LOVE the chambray and white blazer combination! This is the perfect way to wear denim on denim! You look gorgeous!